An estimated loss of 100 litres of kerosene oil. Smell of oil and elevated PID reading in the kitchen, dining area and sitting room. Laboratory analysis contaminants associated with kerosene. Oil contamination in soils beneath and surrounding the boiler house. Oil contamination along the buildings foundations. 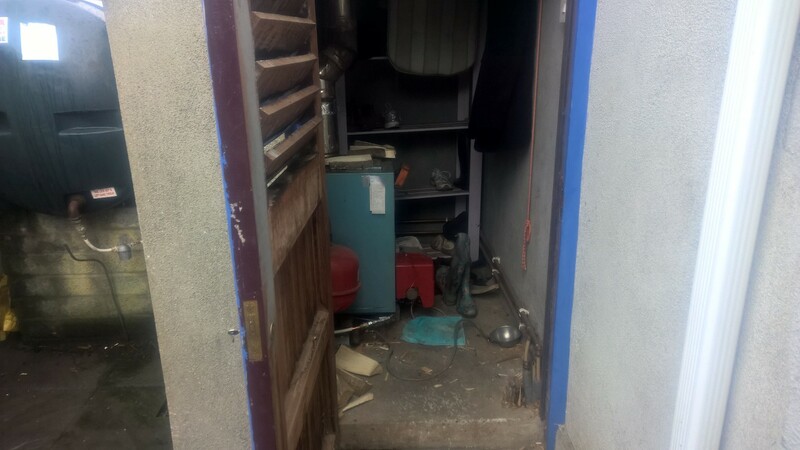 The boiler and oil tank were disconnected and removed. A temporary heating system was set up in the rear yard. The boiler house, oil tank base and oil tank enclosure were demolished and removed from the site. Kitchen units were removed from the works area. The remaining kitchen units were covered in polythene to protect them from dust. A section of tiles was removed from the kitchen floor. A section of wooden suspended floor in the dining room was removed. The concrete floor of the former boiler house was broken out. A section of stone patio slabs was removed from the back garden and the identified contaminated soil and fill material were excavated and removed. Specialised bioremediation solutions were applied to the base and sides of the excavation to treat any traces of residual contamination. The concrete floor beneath the removed floor tiles in the kitchen was broken out and removed. A section of concrete subfloor was broken out and removed beneath the removed suspended wooden floor in the dining room. Identified contaminated soil and fill material was excavated and removed from the kitchen and the dining room. Identified contaminated rising wall blockwork was removed and replaced by pouring rapid set concrete as per the structural engineer’s recommendations. Specialised bioremediation solutions were applied to the base and sides of the excavations to treat any traces of residual contamination. The rising cavity wall for the boiler house was built up. The excavation externally was backfilled with granular backfill material and compacted at regular intervals. A double door was put in the rear kitchen wall where there was formerly a single window. A new trench was dug across the rear yard to facilitate the installation of a new oil feedline. A new concrete oil tank base was poured in the garden – the location of the oil tank was moved further from the house into the garden upon request from the homeowner. A new concrete floor was poured for the boiler house. The excavations in the dining room and the kitchen were backfilled and compacted with granular backfill material and sand blinding was spread across the compacted backfill material. A radon barrier was installed on top of the compacted backfill material in the dining room and the kitchen. Insulation was installed on top of the radon barrier in the dining room and the kitchen. Steel was installed on top of the insulation internally to reinforce the concrete floor.